Go west, young lady! At least that's what they say. I should be packing my bags for a little business trip to LA. Technically I'll be staying in the Brea/Fullerton area, but I should have some time visiting with family and we'll be mobile. And it's my first trip to California since 1989. Sooo...dear readers...got any hot tips on where to eat? 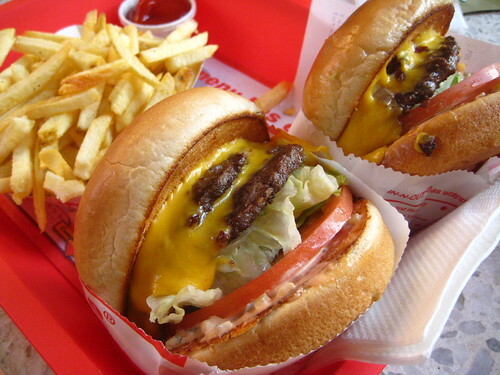 My Azi is an avid reader of the blog and she has already scheduled a requisite In-N-Out visit. I won't have a ton of time, but as with any trip, long or short, I want to make sure I get lots of good food in. Any tasty food trucks or other recommendations east of LA? Even if I don't get there this weekend, I'm sure my Azi would love some great recs near where she lives. Thanks in advance! Im from cali! First find a mexican, ask them where they eat and what they order. Go there, order what was recommended, ask and order the most popular dish and then what the person taking orders says is their favorite. And a tamale. You will be happy. You will never find this no name hole in the wall any other way. And of course find a farmers market! !